Sorry for the radio silence folks. I am just now bouncing back from a weekend of adventurous eating, and the resulting week of gastrointestinal distress. 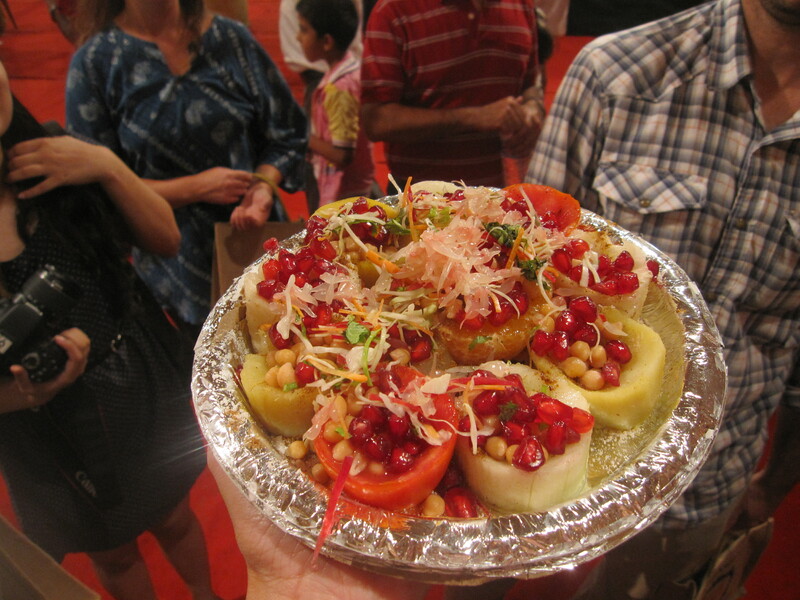 Yes, Delhi Belly is a real thing – an accute bout of indiscriminate tummy troubles that is practically a right of passage here. It was not so much fun. But completely expected after three days of authentic Indian eating. 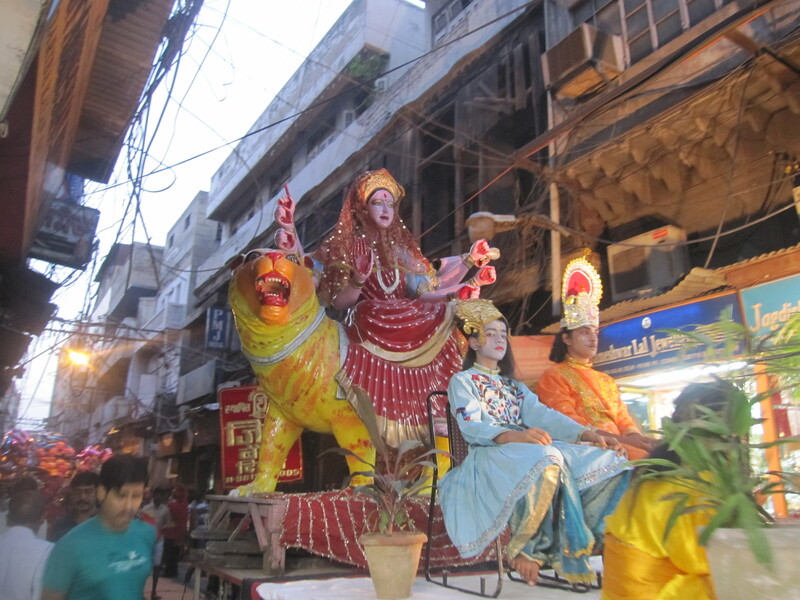 It all began when Husband and I hit up the Dussehra Ramlila festival in Old Delhi. Dussehra is a Hindu holiday that celebrates lord Rama’s victory over the ten-headed demon king Ravana and the triumph of good over evil. It’s often celebrated with performances of the Ramlila, a dramatic folk story about the life of Rama which ends with a ten-day battle between Rama and Ravana. 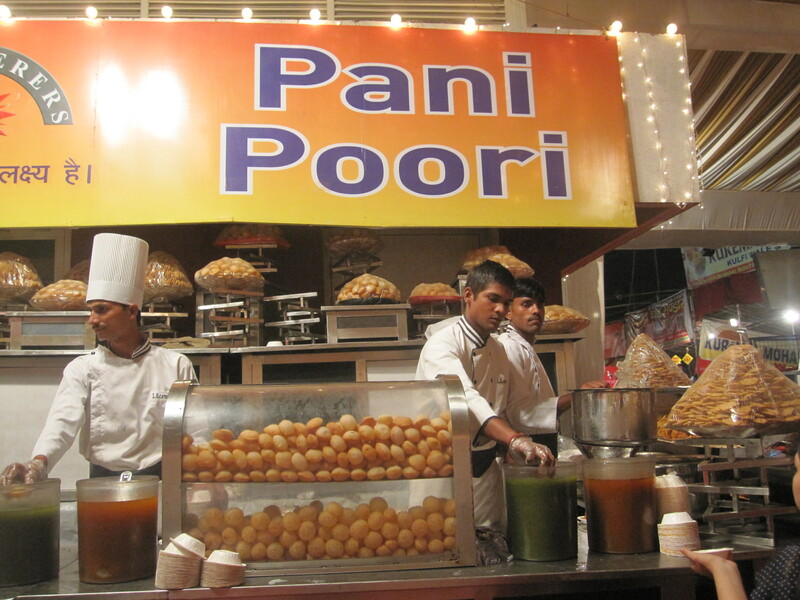 Then we made our way to the food tent where we sampled all kinds of spicy snacks: little fried puff balls filled with a broth that I can only describe as liquid fire, fruit cups filled with crunchy bits and spices, lentil pancakes stuffed with more tear-inducing spice. Did I tell you it was spicy? Holy Lord Rama. It was all carefully washed down with bottled water and hand sanitizer. But there was one moment when we watched a worker douse the same freshly cut fruit we’d just eaten with a bucket of sludgy looking water and thought, Merde. This could get ugly later. But the damage was already done, and there was still Disco Fruit Ice Cream to be tasted! 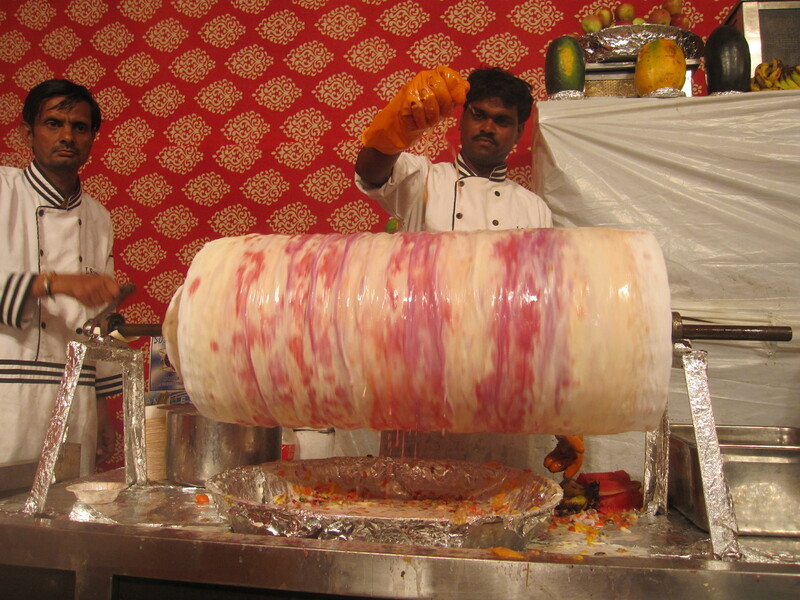 This special festival confection is made by pouring fresh fruit puree and milk over a hand-cranked frozen tube. 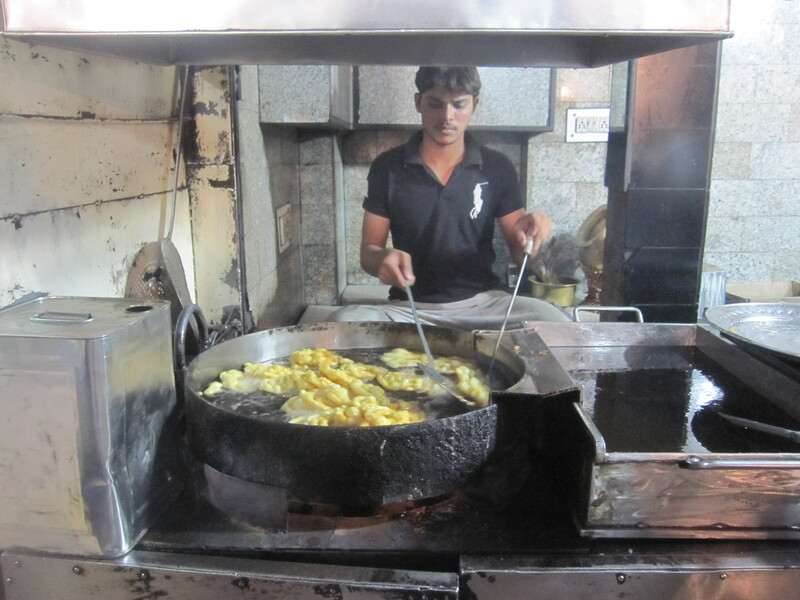 If you want to recreate this machine at home, the Disco chef told me all you need are a few spare rickshaw parts. 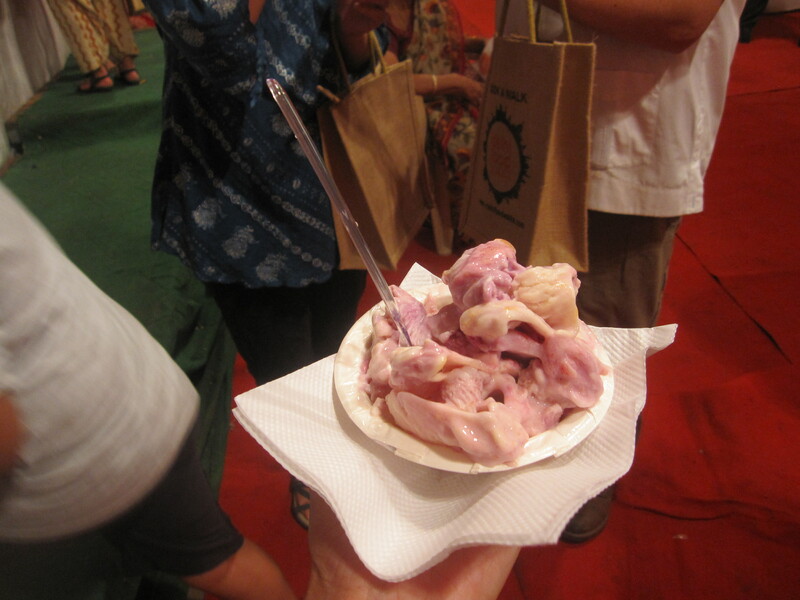 It’s hard to top Disco Ice Cream, but our guide was undaunted. After a brief pause to watch the Ramlila unfold on stage, he skipped gleefuly to the rides. Most of which were hand cranked and also seemed to be built out of spare rickshaw parts. 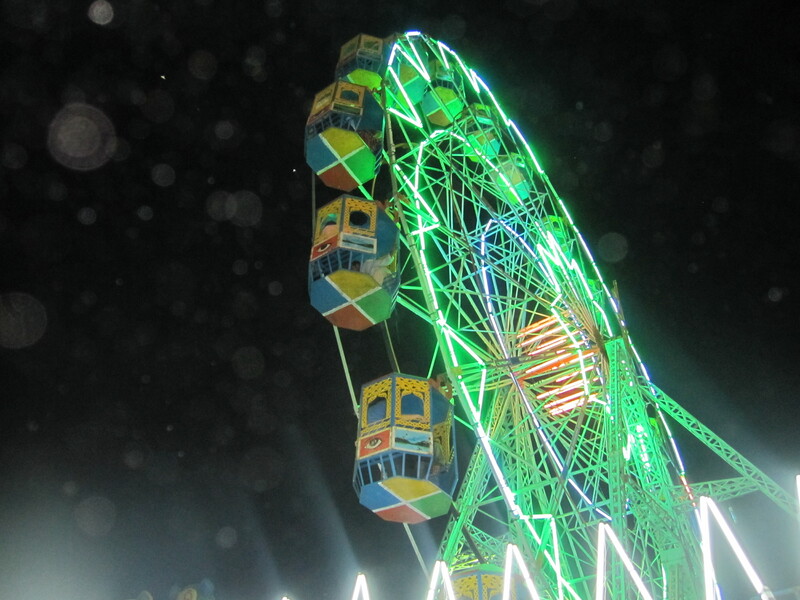 No one in the group seemed keen on taking a rickety spin on the tin ferris wheel of death, which really bummed our guide out. So I jumped on, saying a silent prayer to Shiva, Ganesha, Rama and anyone else I could think of to please let me live to eat another jalebi. Even after that exhilarating experience I was still feeling pretty good. Stomach felt mostly normal. I woke up the next day ready to tackle an authentic Punjabi meal for dinner. And some local biryani for lunch the day after that. Probably not. But am I going to let that slow me down? Never! Then I wouldn’t have any material left for this blog. So I’ll be back at it this weekend, living dangerously – one Disco Fruit Ice Cream at a time. OK! Dare Devil! First rule of the third world. THERE ARE TWO THINGS YOU NEVER EAT ON THE STREET! Cut fruit and ice cream! What the F…! Fruit cut by someone other than the staff at a first class hotel is probably cut with a knife that also cut the raw chicken ten minutes before. And if the fruit is of the type that grows on the ground even worse. Tree fruit gets it’s stagnant waste water filtered by the tree before it gets into the fruit. Melons slurp up the sludge nearby. Need I go on? Ice cream is made with milk and who knows from where or how long ago? Again ice-cream from a brand name only- prepackaged. It will happen again and to your kids too if you don’t listen to your older cousin here. 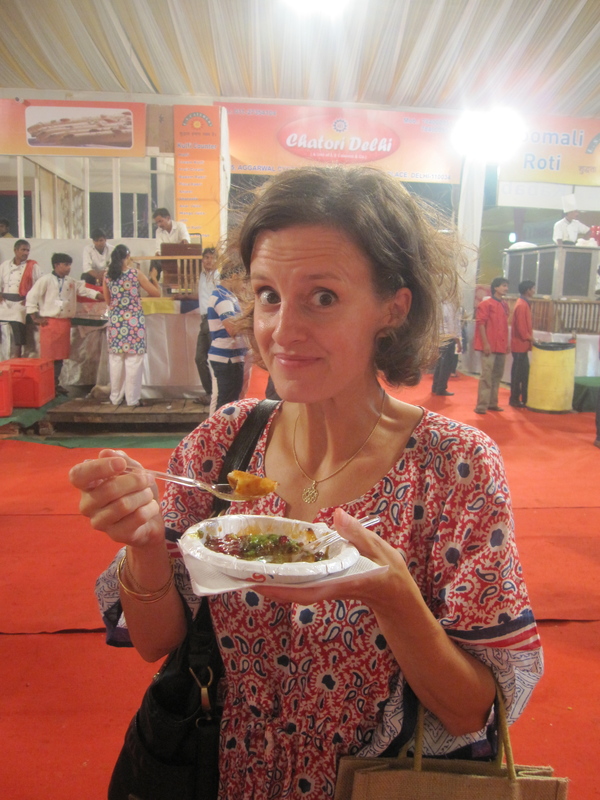 I have successfully avoided Delhi Belly in all countries visited so far. 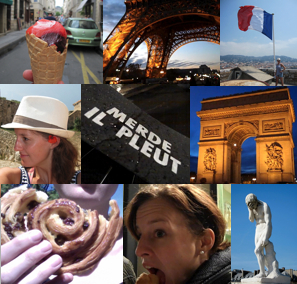 Actually I did use to get a bit sick in France when I would go for just a few days but that was from gorging on everything rich I could stuff in my mouth. … I never said I was that smart either but French food only kills your liver not the rest of you too! Am I jealous? Of course! I love Indian food!!! Save me some lentil cakes! You ARE building up your immune system. And your kids’. When I was a girl my family, including French grandparents, all went to Mexico on vacay. My parents, sister and I, who all lived in DC and shopped at the hygienic Safeway, spent 4 days in our rooms with turista while the Parisian grandparents, who shopped at grungy outdoor markets, never got sick.